KWR Roofing offers asbestos removal in Brisbane or surrounding areas. Often roofers don’t show up or they refuse to work on asbestos, leaving you wondering who can actually complete your asbestos roof removal safely and advise you honestly on a new roof. When you’re replacing or repairing an Asbestos roof, you don’t want the job half-done. Our 10-year warranty on workmanship gives you assurance that the asbestos removal will be completed properly. The result of this is the jobs is done at the price of the initial quote by our licensed tradesman. So replacing an asbestos roof with a new Colorbond or tile roof can make your home safer, and add big value to your home. We abide by all safety laws and Workplace Health & Safety relating to asbestos removal. Because of this we keep our team safe and keeping the home’s occupants safe too. Our tradesmen hold a ‘B class’ asbestos certificate, in accordance with the national asbestos code of practice. We use safety rails for all construction work on roofs. Because safety is so important to us, we perform the asbestos removal under the strictest of conditions. Following these procedures means that airborne asbestos particles are kept under acceptable levels. So rather than worrying about that ageing Asbestos roof, why not call us now to organise a FREE quote from our friendly team. Similarly removing asbestos can be a dangerous and complicated process. Because of this we recommend using licensed professional roofers who will also dispose of it in accordance with QLD Government regulations. 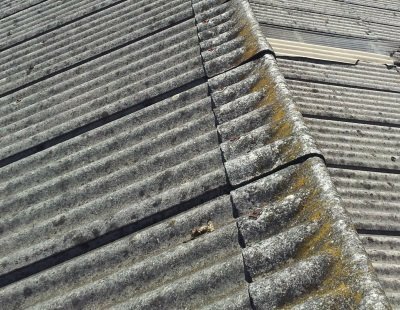 Painting asbestos roofs can provide you with an extra level of protection against the possibility of asbestos fibres being disturbed and becoming airborne and can extend the life of asbestos products. Due to this, special sealants only should be used on asbestos material, as ordinary paints do not bond well to the surface of weathered asbestos cement products. We use and recommend Industrial Roof Coatings Roof Protect Membrane to seal asbestos roofs. Our roof paint product range is the thickest, glossiest and most importantly, safest roof paint for asbestos roofs that you can buy. Save Hundreds with our monthly specials!